What are Electrostatic Precipitators? And how do they operate? Electrostatic Precipitators or ESP’s are a highly effective group of filtration devices, which use an electrostatic charge to remove small particles from flowing gas. Also known as electrostatic air cleaners, ESP’s function by ionising the particles in a gas or air stream, as they travel over ionising electrodes. An electrostatic charge is then applied to the particles, which causes them to become attracted to and thus diverted towards collection plates for removal. Dry Electrostatic Precipitators: remove impurities from dry solids such as smoke and dust. Wet Electrostatic Precipitators: remove liquid droplets such as oil from humidified gases. ESP’s are designed to remove particles as small as 0.01 micron in diameter and depending on their specialism, they can remove both solid particulates and liquid droplets from gas and air flow. By controlling particulate emissions in this way and removing impurities from the waste gases which are released from boilers, industrial process sources and power plants - Electrostatic air cleaners are used as a highly efficient air pollution control device. Once impurities are removed, the clean air and gas then continues to pass out of the precipitator by a stack or chimney, before being released into the atmosphere. The impurities which have accumulated on the collection plates, are then transported into a hopper, located below the ESP structure where they are stored for disposal. What are the common Electrostatic Precipitator issues? Unlike any other air purification or pollution control technology, Electrostatic Precipitators do not provide the grounds for the developments of harmful bacteria. However, their collection plates can become incredibly difficult to clean and can therefore develop build-up, which if left to stagnate, can produce nitrogen oxides and ozone- common air pollutants which can contribute to smog formation, breathing difficulties and acid rain. 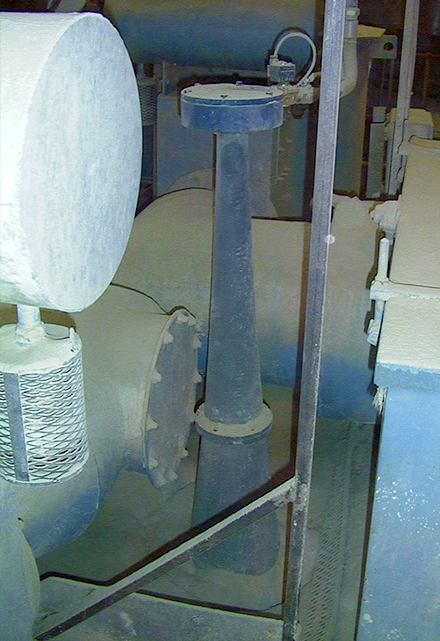 No other Electrostatic Precipitator issue, other than an explosion or a fire, causing catastrophic damage, has as much potential to decrease the operation and performance of Electrostatic Precipitators, than hopper pluggage. Caused by friction on the hopper inner walls, particles are encouraged bind together and form blockages. This causes a huge limit to the mass flow of materials, which in the worst case scenario, could cause the flow of material to be halted completely. However, because the effect of hopper buildup and blockages are not immediately apparent, hopper pluggages are hard to diagnose. It is therefore important to employ technologies, which unlike Mechanical Rapping Systems, can prevent hopper issues before they have have an effect upon Electrostatic Precipitator efficiency and operation. ESP's remove particles from flowing gases using an induced electrostatic charge. What are the disadvantages of traditional Electrostatic Precipitator cleaning methods? An effective Electrostatic Precipitator cleaning method, should be a process and technology which not only cleans, but maximises the efficiency of an Electrostatic Precipitator. Such a method must therefore exercise its duty, whilst also maintaining the quality of the ESP structure and working form into the future. However, not only do traditional Electrostatic Precipitator cleaning methods fail to provide a longterm solution for common ESP issues, but they can also cause these problems to be exasperated further. Mechanical Rappers are a system of heavy vibrators which are typically employed alongside an Electrostatic Precipitator to dislodge the build up of particles from ESP collection plates. Mechanical Rappers are usually operated by an extremely heavy piston hammer, which is lifted in order to gain energy and then released, causing the hammer to fall and cause a huge vibration. However, whilst this initial vibration may be successful at dislodging build-up, in the long-term, such a vigorous and repetitive motion can increase the likelihood of structural damage, not only upon the ESP, but the Mechanical Rapping System itself. If handled manually, the Electrostatic Precipitator cleaning process can be a dangerous operation. This would involve the need for multiple workers to enter the hopper beneath the ESP to hammer on the individual collection plates to remove material build-up. Workers are therefore exposed to falling debris from the collection plates, whilst working in cramped and hot conditions. However, not only does this pose a significant risk to the safety of employees, it is not efficient to manually clean Electrostatic Precipitators in this manner. Similar to Mechanical Rapping Systems, rather than dealing with the issue of build-up by prevention, this method waits for the issue to take hold of the ESP and have an effect upon the efficiency of its operation, before taking action. Electrostatic Precipitator issues can have a significant impact upon production. How can Acoustic Cleaners solve Electrostatic Precipitator problems? In contrast to traditional ESP cleaning methods, Primasonics Acoustic Cleaners provide are a non intrusive technology, which provides not only a superior cleaning solution, but a long-term and preventative answer to common Electrostatic Precipitator issues. Acoustic Cleaners are designed to create a series of high energy- low frequency sound waves, which work to penetrate through accumulated material and build-up with rapid fluctuations in pressure. This causes the particles of the compacted materials to vibrate at different rates to their surrounding environment, which causes the particles to debond from each other and dislodge from the collection plate surfaces. Furthermore, unlike Mechanical Rapping Systems and any other Electrostatic Precipitator cleaning technology, Acoustic Cleaners are designed to tailor their frequency to deal appropriately with different levels of build-up, over different distances. Acoustic Cleaner are therefore able to eradicate build-up not only on the ESP collection plates, but the entire hopper and ESP structure. Acoustic Cleaners are designed to reflect sound from solid surfaces, meaning their soundwaves will only target and penetrate accumulated material, unlike intensive methods which target the whole ESP and hopper structure. Acoustic Cleaners are therefore able to prevent issues of restriction to mass flow, whilst also expelling issues of hopper pluggage without causing mechanical stress and structural damage. Primasonics Acoustic Cleaners are the most efficient replacement for Mechanical Rappers.